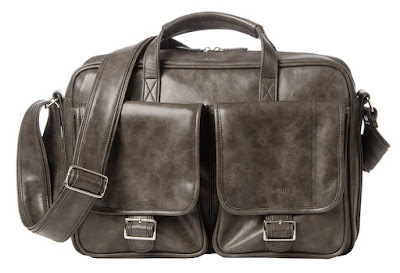 This briefcase is big enough to carry everything you need and then some. Marbled graphite faux leather bag features two large exterior pockets with secure snap closure and wide back pocket with Velcro closure. Interior is lined in black and grey checkered fabric and features a padded laptop pocket as well as two zippered pockets, two open pockets, three card slots, phone pocket and two pen pockets. Easily fits a 15” laptop. Comes with wide adjustable strap for easy carrying. Silver hardware. Noninterchangeable. Bag dimensions: 16” long x 11 ½” tall, with a 4” gusset. Top handle dimensions: 16” x 1 ¼”, with a 3 ½” drop. Strap dimensions: Adj. to 61” long x 2”, with a 27” drop.